A few years ago, our 6 year old daughter Abigail heard about the orphans in China. How little girls are routinely abandoned, and it rocked her world. She couldn’t stop talking about it, and one day she declared that when she grows up, she would adopt a baby from China. She decided to start saving up her money when she heard that adoptions are very expensive. She took it so seriously that she saved up every dollar she earned from birthdays, Christmas, allowance, etc for an entire year. She saved up $400 that year, and really inspired us with her determination. In the meantime, the Lord began working on my heart. One day, as I was walking our dog, I began to pray and ask Him to show me what was on His heart. I instantly saw an orphan in my minds eye. She was a little girl, dirty, abandoned and sitting all alone on a savannah. I knew instantly that the Lord was trying to show me His great love for the orphans. That He thinks about them, they are on His heart. Well, when you know Him and how awesome He is, then you definitely want what is on His heart to be on your heart! 🙂 So I began to pray that He would show me more, show me what He wanted me to do, etc. About a week later, on Abigail’s birthday, I suddenly had the realization that we were to adopt a child from China. I don’t know how I knew, except that we were driving to her birthday lunch, and it was like I had a profound revelation of it. It seemed so odd, yet so familiar at the same time. Like all my life, He had been preparing me for this very thing, yet I never realized it until now. I spoke to my husband about it, and he wasn’t on board at all. After all, we already had 3 children, and were not financially well off. He had a lot of concerns, and didn’t feel any kind of pull to the whole thing. Our kids and I would pray every day for God to change his heart. We all knew that we knew that this was meant to be for our family. Slowly but surely, my husband caught the fire, and came on board. He still wasn’t very enthusiastic, but he agreed to start the process. One day after church, we were driving home talking about things concerning the adoption. My son, Jonathan, who was in the very back of the car suddenly blurted out, “Mom! I just heard the words CHING HOW in my head! !” We thought that maybe it was some sort of sign from God about our adoption, since the words actually sounded like Chinese words. We went home and looked it up, but couldn’t figure out how to spell it. We thought maybe it was the name of a city in China, or something that would give us a clue on how to identify our daughter. At that point, we knew that we wanted a waiting child, because the thought of a child not only orphaned, but with a special need but without a mommy to love her, just made me sick. I really wanted to be a mommy for someone who really needed help in this life, and felt led to walk the special needs route. We were open to super correctable special needs, though and were hoping for something minor. A couple of weeks later, I received an email from a friend in Tennessee. She said that there was a little girl in China whose file was about to be sent back because nobody had expressed interest in adopting her. She asked if we would be interested. The little girl’s need said, “Congenital Blindness”. I was instantly filled with fear. 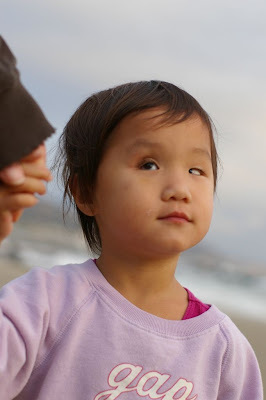 The thought of a little blind girl being turned away for adoption made me so sad. But could I actually parent a blind child? It sounded SO hard, and I really struggled. I had this really strange feeling inside. It was as if this girl was already my daughter. But it wasn’t something that I would have ever ever chosen as a special need I could handle. I spent a few moments by the computer, struggling. I was hoping for something like a repaired cleft lip, or a birthmark. I would even be open at that point to missing limbs, etc. But blind? It sounded terrifying. I decided to email her back right then and there, without ever telling the rest of the family about her. It made me sick to even write the letter, but I said no thank you. I had a deep sense of regret after I sent the email, but I tried to forget about it. A few weeks went by. Then we got an email that would change our life. It was addressed to my husband and I and was from a friend in Kansas City, who doesn’t know our friend in Tennessee. 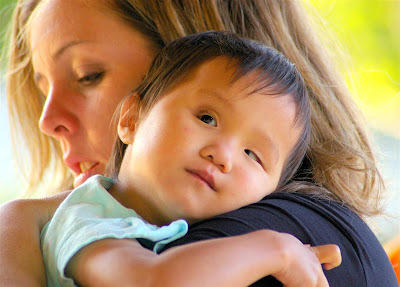 She said that she got an email from an adoption advocate in Ohio, about a little blind girl in China, and she felt strongly like she should forward this email to us. I read the little description, and I knew it was the same girl who came into my inbox a few weeks before. My daughter. My heart started to race. Just then, my husband asked me if I received the email. I said yes. Up to this point, he had been very unemotional concerning adopting. He was mainly doing it because of the passion he saw from the rest of us, and from praying, he knew that it was God’s heart. But he didn’t feel anything, and to be honest, wasn’t very excited. I asked him, “What did you think of the email?” He looked straight at me and said, “That’s our daughter.” I was rocked. What? My husband who was a little skeptical at first about adopting a special needs child, was now saying this blind girl was our daughter. We stared at eachother. I said, “But shes blind. That sounds so scary.” He said that it didnt matter. That this girl was special, he just KNEW it, and that God would help us to raise her. I was FREAKING out inside. I went through the next 24 hours in a state of mental anguish. I had to release a lot of fears and concerns to the Lord. First of all, we are a homeschooling family. How would I know how to teach her? I don’t even know Braille, etc. I felt totally unprepared for her need, I had no information about raising a blind child, and it seemed way too overwhelming to find out. I had to deal with a lot of things, also just grieving the fact that I really am a visual person, and love making eye contact with my children. I couldn’t imagine not being able to make eye contact with my daughter. I struggled, and prayed, and struggled some more. My husband was set. He knew that he knew. It didn’t matter to him at all that she was blind. I was rocked by him. I couldn’t believe it. Just the week before, I was crying to my friends that my hubby didn’t seem that on board with the adoption, and here he was absolutely madly in love with a blind child. It was amazing. I laid down on the living room floor, and said to the Lord, that if this was really Him, then I would lay down my life for this little girl, and lay down my fears, etc. We sent an email to her agency, requesting her file. It was 6pm by that time, so we had to wait ’til the next morning. I spent the night tossing and turning, and the next morning I went on a walk with our dog. I wrestled with the Lord some more in prayer. I finally said, “God, you know this is so huge. I need another sign this is You. It’s so life changing. Please. If this is You, please let her name be CHING HOW” (the name my son heard in the car) I felt so strange telling the Lord that. It felt so immature, but I was desperate for a clear, clear confirmation. Well, I got home from my walk, and went to check my emails. There was an email from the agency. There was her file. I opened it. Up on top, was her name in Chinese letters. Underneath her name, it said, “pronounciation: CHING LEE HOW” I was stunned. I read it again. Ching Lee How. The moment was one of the most surreal moments in my life. It was like time stood still. I picked up the phone and called my husband at work. “Her name is Ching How” I blurted out once he said hello. And then I burst into tears, and sobbed and sobbed. God was so good. He knew this was so hard, and He made a way for me to know, so that I would never doubt it again. The next few months were frantic paperchasing. Once I knew this was the Lord, I was filled with so much love for this little girl, and my fears were fading away. We paperchased so fast, and got the dossier in within a matter of 3 months, starting from scratch. The China end of things wasn’t so quick, and we ended up waiting 120 days for our LOA. But we hung on and persevered. Plus, when we started the adoption, we literally only had $50 in our bank account with no savings, nothing to fall back on. We had to trust the Lord to raise every single penny for this adoption. So we busied ourselves with fundraisers, and met a lot of amazing people along the way. On the day we left for China, we still needed $4000. We decided to trust the Lord, and start on our way to the airport, knowing full well that we needed to bring $6000 in cash to China, but knowing that we only had $2000 in our wallet. We were panicked, but at that point, when your plane is leaving in a matter of hours, all you can do is put one foot in front of the other, and trust that God will work it out. Well, our friends were having a little prayer meeting for us before we took off for China. We got there at 7pm. At that point, all the banks were closed, and even if someone were to hand us a check, it wouldn’t have really mattered, because we needed everything in cash. We got to the meeting, and everyone gathered around. They asked how we were doing and what they could pray for. I basically said that I wanted wisdom to know what the right thing to do would be…. should we continue on the flight knowing we didn’t have all the money going to a foreign country, etc. or should we cancel and wait until we raise the money. Someone in the group asked how much we needed. I said, “$4,000.” It seemed so crazy, that is so much money! But he looked at me square in the eyes, and said hold on. He went in the other room, came out, and handed me 4k in cash. He said that he owns a property by the beach, that he rents out. His tenant happened to drop by A WEEK EARLY to pay his rent because he was going out of town. He said this has never happened before, but the tenant paid him in ALL CASH. it was $4,000 exactly. We were floored. We felt so bad taking $4,000 from someone. After all, he needed the money to pay the mortgage on his property! But he kept insisting, and they all sent us off to China. The next morning, our friend got 2 random checks in the mail. They were both for work he had done years ago (he’s an actor) and he was completely not expecting. One check was for $1200, and the other one was for $2800, totaling $4,000. God is so faithful!!!! When we went to China, it was an amazing experience. We all fell right in love with this little bundle of joy. She was very scared, and although she was super cuddly and wonderful, she also would go from giving a kiss to head bonking our jaws really hard, or trying to choke us. Or socking us in the head. It was really painful! I cried many a tear from sheer pain in China! I could tell she so much wanted to let go and receive the love, but there was so much hurt underneath it all. Imagine not being able to see or understand the language your new family is speaking. She was scared. Slowly but surely, the aggressive behavior began to subside, and she began to relax and have fun with us. She loved to giggle, and loved being swung around by daddy. She loved going swimming, and was totally fearless of the water. Our time in China was a bonding experience for our family. It was wonderful, amazing, totally hard, and draining. I cherish every memory of it. Now we have been home with her for 9 months. It hasn’t been scary like I thought it would be at all. She’s my daughter. I love her so much. I can’t imagine life without her, and I can’t stand to think of what would have happened to her if she had remained in China. In China, there aren’t a lot of opportunities for the blind. I have heard that the only options the blind have are becoming a masseuse, a potter, a beggar, or living in a retirement home for the rest of their lives. I’m so glad that we brought her home, and are able to give her amazing opportunities that will help her become anything she desires to be. Most of all, I’m glad that she has found the love of a family. She is such a wonderful person. Talented. She really is attracted to musical instruments and I wonder if she will one day be a pianist, or a violin player. Whatever interests develop, I’m confident that there will be resources here to help her succeed at whatever she hopes to do. Although I homeschool my other children, at this point, she attends an awesome place called the Blind Children’s Learning Center. She receives physical therapy, occupational therapy, orientation and mobility, and speech. She was very delayed in a lot of areas, and is slowly but surely catching up. Her aggression has subsided quite a lot. It’s still there, and comes out in moments of stress, but its not at all like it was during our first few weeks together. I have found that she really craves and needs routine, and does really well going to school because she knows exactly what is coming next, etc. She is starting to thrive, and its so exciting to watch her progress every day. I’m so thankful to God for leading our family to her. It has been hard, but it is always worth it. Now suddenly, my heart is being pulled to adopt again. My husband said he would have to know its God to add a 5th child to our family. 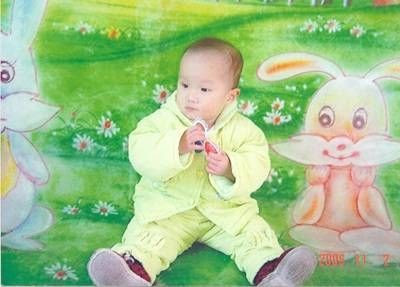 I can’t stop thinking about the Chinese orphans, and am feeling pulled, pulled, pulled back to China. We’ll see what happens!